I rode with my brother in law for a bit while the weather was cooperating the other day. 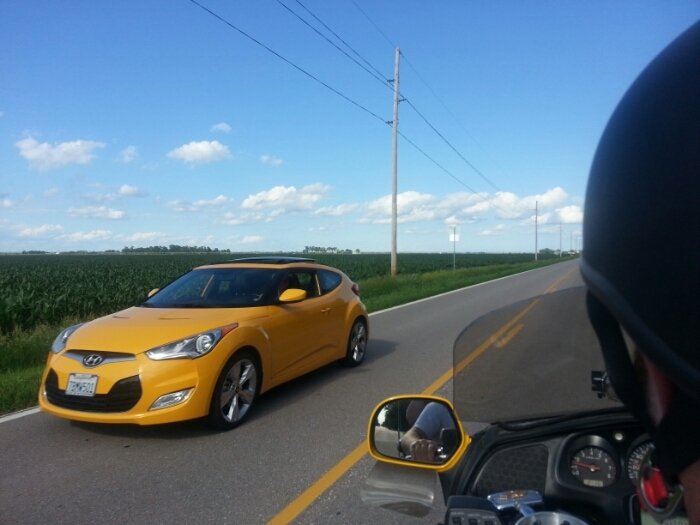 I trust him with my life, so while riding his motorcycle I took a few pictures of our time together. Everyone say HI to my BIL, Double D. He’s been keeping my baby sister happy for years. DD’s a man’s man, a diesel mechanic, and a farm boy originally from Colorado. The bonus is that this gem of a man is brilliant and plays the piano, as well. Nothing hotter than a Renaissance Man. My Sis can pick’em. Thanks for the ride, Double D. Love ya! This entry was posted in Recent Posts and tagged Audrey Dawn, Brother In Law, Harley Davidsons, Inspiration, Mechanics, Motorcycles, Open Rode, Photography, Poems, Poetry, Renaissance Man, Writing, Yellow, Yellow Honda. Bookmark the permalink. Hi Double D. I haven’t read the comments, but I hope someone mentioned the color co-ordination between passing car and bike. Great job. That’s great that they’re happy together. And…nice ride there! Was it fun? Did he 100 mph? He is proud of his bike. It is a beaut! It was fun, but totally not my thing. I have this fear of being splattered all over the road. Call me crazy. NO, 100mph. I would have killed him and he knows it. I hope you were roped to the bike!!! I wasn’t, and now you’re also going to tell me that I’m out of my mind, correct? Giggle. How can anyone that writes as beautifully as you be called crazy. The person saying it would have be crazy too. I’ve just watched it on You Tube, you really shouldn’t been stood up. I wasn’t standing, I assure you of that, Richard. Can you imagine!! LOL I’m not a trick rider…although I may become a paid motorcycle poet that way. Maybe. Start practicing…we’ll go on the road. You took the pics from the bike? Very cool! I did, Rajiv!! Am I crazy, because I’m beginning to worry it was too much of a risk. LOL Thank you! Well, from an Indian perspective, no. We believe that the Gods will shield us! On my monochrome blog, I intend to put up a picture I took while hanging out of a train! I believe I was shielded as well, so we’re not so different in our beliefs. You really did that, Rajiv?! So cool of you! Oh, come on! Not you, too, Chum. My commas narrowed the focus to compliment the magnitude and femininity of that particular poem for this paricultar poet, Red. *giggle* We like being needed, Mark. Haha! You’ve just revealed a trade secret, my dear. You must. Totally must. I don’t think I could have done what you did. Honest. You really are Superwoman! Giggle. OK…yes, I am Superwoman. 🙂 You must try this, too. No no no. My motorcycle days are over. Well…… ONLY if I trust the driver explicitly. I may change my mind. But, I would hang on with both arms. Audrey!!! You are a dare devil in there as well as Superwoman! Yikes!